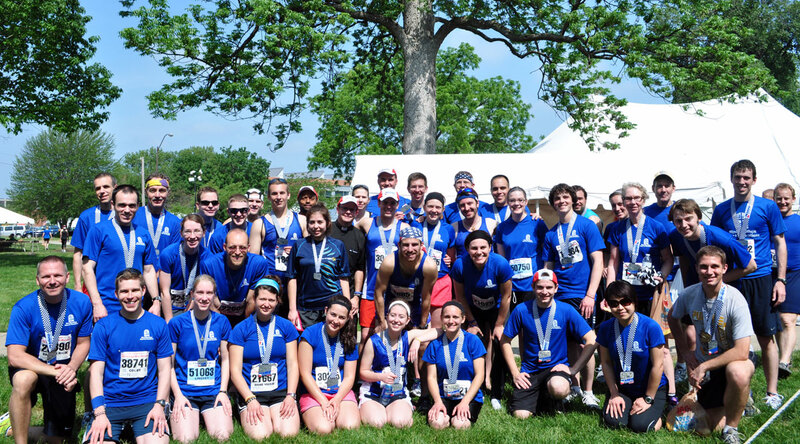 Members of the Race for Vocations team pose for a photo after competing in the OneAmerica 500 Festival Mini-Marathon and the Finish Line 500 Festival 5K, both in Indianapolis on May 5. (Submitted photo) Click for a larger version. “I was on mile eight, and I ran by a man who asked me, ‘What’s a vocation?’ ” said Cleeter, a member of St. Monica Parish in Indianapolis, who participated in the 2012 Race for Vocations—a race that took place within the OneAmerica 500 Festival Mini-Marathon and the Finish Line 500 Festival 5K, both in Indianapolis, on May 5. “We continued to talk for the remainder of the mile about vocations and the Catholic Church,” Cleeter said. That moment was just one of the many highlights during the fifth annual Race for Vocations. The event drew 350 runners and walkers from the Archdiocese of Indianapolis and the dioceses of Evansville and Lafayette for one common purpose—to pray for vocations in the Church. The Race for Vocations combined several components which require extreme self-discipline and the sheer grace of God—prayer, discerning one’s own vocational call and training for a 13.1-mile race. Completing any one of these goals is a difficult feat. On May 4, the night before the race, a Mass and pasta dinner were held at St. John the Evangelist Parish in downtown Indianapolis. A large tent housed this year’s dinner festivities, including live music from a band coordinated by Ron Kramer. Participants had the chance to pick up their bright blue T-shirts that would identify them during the race, and they had an opportunity to share a meal with old and new friends. Priests, seminarians, deacons, religious sisters and brothers as well as families and single people from Indiana and beyond were in attendance, representing a full array of vocations within the Church. Father Joseph Moriarty, director of spiritual formation at Saint Meinrad Seminary and School of Theology in St. Meinrad, was the principal celebrant at the Mass. Father Moriarty spoke about one of his former teachers, Helen Dalton, who made a tremendous impact on his life and journey of faith. Maria Jansen, a pharmacy student at Butler University in Indianapolis, was training for her second Race for Vocations when she faced an unexpected roadblock. She had planned on a demanding training schedule to increase her pace during this year’s race, but a knee injury in April changed her plans. She found herself needing to take a break for a couple of weeks to recover. “At first, my injury really upset me, but after a week I could put it into perspective of why I was really running the race—to pray for vocations,” said Jansen, a member of St. Monica Parish in Indianapolis. Instead of daily runs, she attended daily Mass whenever possible, and continued to pray for those participating in the race and for an increase in vocations. Her knee healed in time for the race, and she was glad to be able to run alongside her training partner and friend from school. Next year’s race will be on May 4. People are encouraged to visit the archdiocese’s Vocations Office website at www.HearGodsCall.com for information about the next Race for Vocations, and to learn how to stay involved in praying for vocations. The website also highlights vocations events that will be offered in the coming months.